Mordian 7th Regiment: Heresy Era Imperial Fists - Veteran Squads and Contemptor get some brush time! 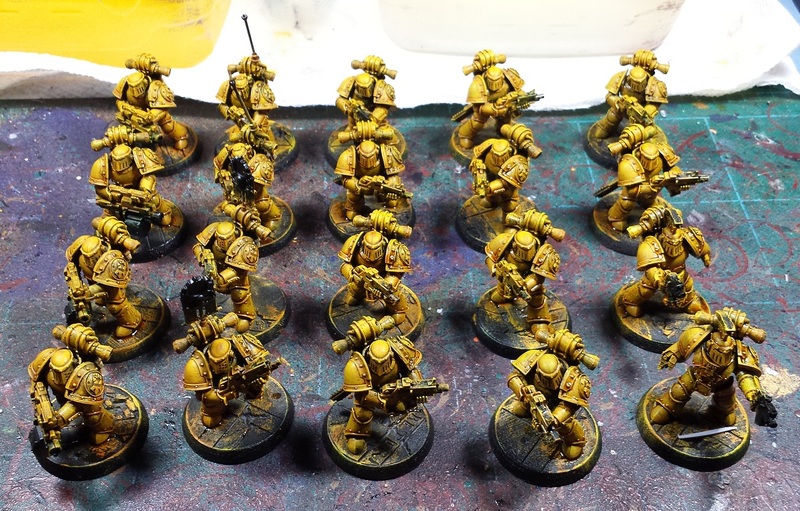 Heresy Era Imperial Fists - Veteran Squads and Contemptor get some brush time! Hope the holidays were safe and fun for everyone, it was a whirlwind of activity for me though sadly not as much of it was actual painting time. Even a painting servitor deserves time off to celebrate the Feast of the Emperor's Ascension, right? 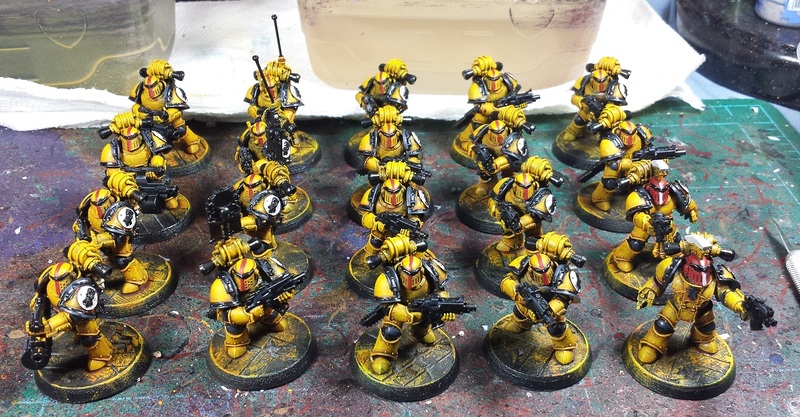 Now that it's passed I have managed to rekindle some painting mojo and set to on some Imperial Fists with renewed gusto! To begin with I figured the painting servitor had had enough time off thank you very much, and it was high time it got plugged back in to the duty station. Turned the settings over to batch paint and started slinging the yellow around! 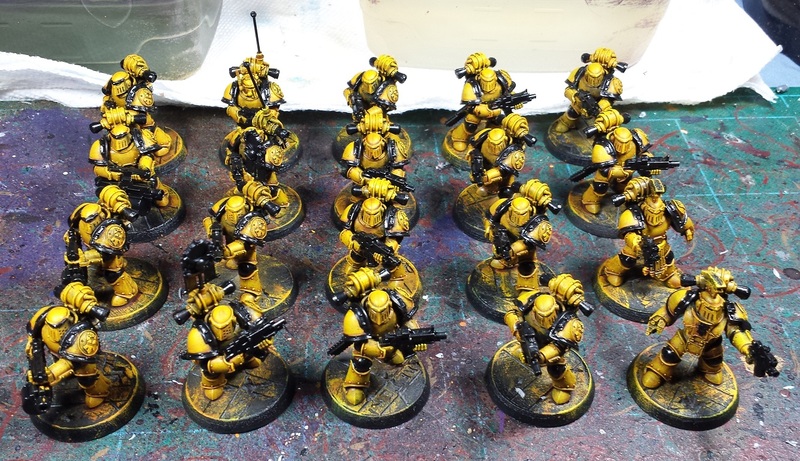 Started off with a basecoat of Vallejo Scrofulous Brown, followed by a heavy drybrush of Golden Yellow, and then a light drybrush of GW Flash Gitz Yellow, concentrating on the uppermost surfaces. Once that was done the whole model was given a Seraphim Sepia wash and left to dry overnight. The next session was the tedious one - going back in and re-blacking in everything that's intended to be metal or, well, black. I've been tempted to just bypass this step and just paint the metallics over the yellow, but I've found that it tends to end up looking sort of spotty and unfinished. Boring, but necessary! Next up I could actually start doing some interesting stuff with the models. The black areas were given a bit of a highlight (which will likely get one further highlight, based on how I'm feeling about them at the moment), the icons on the shoulder pads were roughed in and just to paint something besides black and yellow for a bit the red veteran stripes were added to the helmets, and the sergeants got the full red helmet with white stripe look. They're starting to come into focus now! While I was about it I'd been working on the Contemptor as well, and it's more or less keeping pace with the two veteran squads. Gives me a nice little break in the batch painting process, and helps ensure that it'll match up with the infantry! I have a couple days off coming up around new years, and am hoping I can get these lads finished over the upcoming long weekend. Hope you all have a safe and happy New Years! Great stuff, the painting machine is back on! I would suggest doing the Power Fists black and white, perhaps to match the Black fist of the IF icon? Love the yellow hues and overall look so far, so speedy! @The GunGrave: Thanks - It's mostly liquid talent via the sepia wash, works really well on the yellow! @Siph Horridus: Good call on the power fists, will definitely do that! In fact I think I may go back and do the terminator's power fists in black as well, they're a little bland as-is! @Da Masta Cheef: Cheers bud! Every day's a good day when you paint, so sayeth Bob Ross! 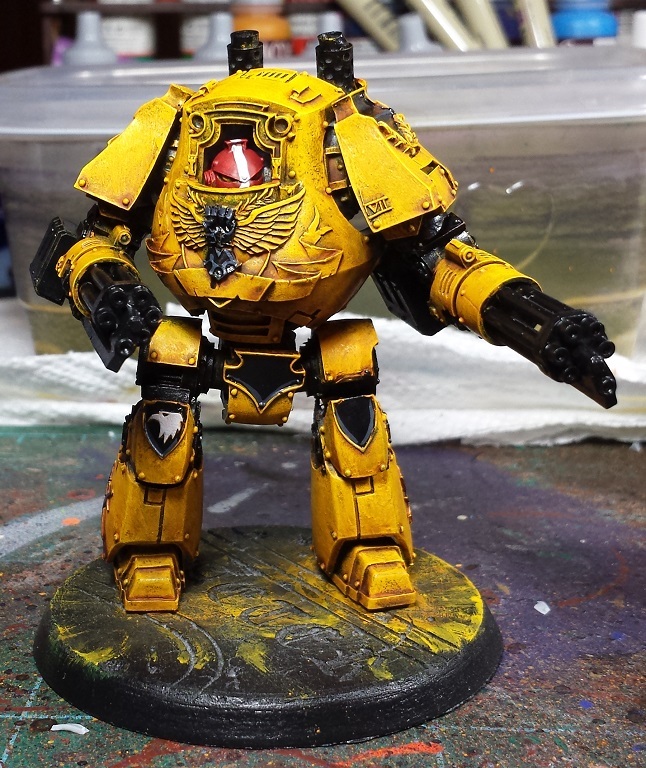 Nicely done dude, your Imperial Fists rock! Right after more bacon and mice pies. Always very impressed by how you do bright colours - doing historicals gives me a fear of anything that isn't muddy and brown. And also an impressive amount of painting there for one session! @Zzzzzz: Indeed, it had sat idle far too long! Actually had mince pie over the holiday, it's a staple of holiday pies in my family. Tasty! @Colonel Scipio: Thanks man! To be fair, this post represents four separate day's paint sessions. I'm crazy, but not THAT crazy. Hah! Thanks for all the kind words everyone! It's felt good to get back behind the brush!